Squirrels have bitten to death a stray dog which was barking at them in a Russian park, according to a local media report. 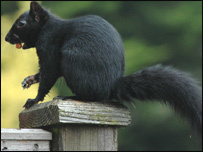 Passers-by were too late to stop the attack by the black squirrels, which reportedly lasted about a minute. They are said to have scampered off at the sight of humans, some carrying pieces of flesh. The attack was reported in parkland in the centre of Lazo, a village in the Maritime Territory, and was witnessed by three local people. A "big" stray dog was nosing about the trees and barking at squirrels hiding in branches overhead when a number of them suddenly descended and attacked, reports say. A Lazo man who called himself only Mikhalich said there had been "no pine cones at all" in the local forests this year. "The little beasts are agitated because they have nothing to eat," he added.